It’s Germany, it’s World War 2. A young girl, Liesel (Sophie Nelisse) is delivered by her mother to a couple, Hans (Geoffrey Rush) and Rosa (Emily Watson) to be kept safe from the Nazis. Then a boy, the son of a friend of Hans, Max (Ben Schnetzer) arrives on the doorstep. Jewish and persecuted, he lives for a time in their basement. Oh, and the whole thing is narrated by Death (Roger Allam). I finished the book on the edge of a pier in Finland waiting for the ferry to take me to Estonia, very romantic, weeping and loving it. 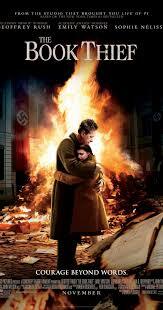 I felt that the film was a very good World War 2 film, emotional, dramatic, with magnificent performances well told. My only issue was that, in the film version, I don’t think it needed the narration from Death. That worked so well in the book, but the story in the film told itself beautifully, so I felt the narration was not needed. The Book Thief was nominated for an Oscar for Best Achievement in Music Written for Motion Pictures, Original Score (John Williams). It was also nominated for a Golden Globe for Best Original Score – Motion Picture and a BAFTA for the Anthony Asquith Award for Film Music.